From first-person shooter to stealth, here are 25 of the best single player PC games you should never miss. What are the best single player PC games for you? I bet it’s hard to decide, right? There are tons of great video games out there that are both exciting and addictive! They’re easy to play too since you don’t need any of those expensive consoles. If you’re having a hard time choosing, I can make it easy for you. I grouped the best games according to different categories. These include first-person shooters, role-playing, and even strategy or stealth. You will also know what makes these games stand out from the rest of the pack. Check out our list of the top PC games of all time! Experience an out-of-this-world adrenaline high with some of the best PC games of all time that feature a first-person shooting gameplay. The fourth installment of the Doom Franchise is a phenomenal fan favorite. The makers took their time to release a new major installment after Doom 3. The first-person shooter game, though, proved to be worth the wait. The game received praise for its graphics, gameplay, and even its soundtrack. Get ready to be a space marine battling demons on Mars! Following the success of Doom, id Software released its first-person shooter game called Quake. Players collect keys and activate switches to get through doors in a dark, gothic, sci-fi world that also comes with medieval castles. A notable improvement from Doom, Quake offers 3D rendering and 3D acceleration for a better gameplay experience. Much more than another science-fiction shooter, XCOM 2 is a tactical video game. It requires resourcefulness and time management. Players take control of XCOM’s mobile base, the Avenger, and give commands to the fighters to stop an alien invasion. The player must also oversee the engineering and research department to develop new weapons for battle. If you’re looking for the ultimate survival horror game, then you only have one choice: the first-person shooting game Resident Evil. Resident Evil 7, which you can now download on Steam, takes the word “horror” to a whole new level. It tries to depart from the usual zombie enemies to deliver top-notch gore courtesy of the Baker family. Beat them in one of the scary games you can get your hands on – and live. Step into a whole new dimension, reload your weapons, and bring yourself to different adventures. Here are the best single player PC games in the action/adventure genre. Angelina Jolie may have been well-received on the big screen in Tomb Raider, but Lara Croft has been well-loved on the small screen long before that. The second installment of the action-adventure video game features new moves, weapons, and even vehicles for the action-adventure character Lara Croft. The gameplay follows her as she investigates the legendary Dagger of Xian. One of the best single player PC games, Grand Theft Auto V allows you to play three criminals in the fictional state of San Andreas. This action-adventure game lets you control the three characters in their attempt to commit a heist. You can play from either a first-person or a third-person perspective. You can also navigate through the open-world gameplay by vehicle or foot. Complete a mission to move on to the next and be victorious in the heist! The Last Express is more than an adventure game. It is a time-travel experience! Be a passenger on the Orient Express’s last run before World War I starts. You’ll be in for a journey full of lies, conspiracies, romance, and treachery. A unique feature of this game is moving and interacting with other characters on the train in real-time. Why don’t you share this adventure with friends and family then? Who do you want to be? You can be an elite commander, mercenary, or a dragon slayer. Take your pick among these fun PC games. Pillars of Eternity II: Deadfire is the anticipated and applauded sequel in the Pillars of Eternity franchise. It follows the Watcher as he goes through a dangerous mission that will take him deep into the waters to catch Eothas, the god of light. Fans love it because of new elements that enhance gameplay, including new companions. They possess different skills and classes to help the player in times of need. This seafaring adventure allows you to chart your course for the expedition and make your own adventure! Fallout is one of the most successful single-player games for RPG die-hards. Its amazing turn-based strategy, strong storyline, and challenges make it worth the hustle. You can also upgrade your skills to win. Of the many sequels, Fallout 4: New Vegas ranks first. It scored a whopping 10/10 in Steam! Download one of the best single player PC games today and battle it out in the post-nuclear Sin City against new villains. The 7th installment of the popular nineties role-playing game was such a hit that it’s already been made for PlayStation 4! The game’s story follows mercenary Cloud Strife in his quest to stop a huge corporation from destroying the planet by using its essence to build an energy source. Final Fantasy VII features three different modes: battle screen, field, and world map. The elite soldier Commander Shepard comes back to save humanity from threats coming from the other side of an unexplored intergalactic portal. It takes place right after the events of the first Mass Effect video game. BioWare’s action role-playing video game received overwhelming praise from critics, receiving a whopping 96 out of 100 on Metacritic. Fans of the first installment can bring their old game files to Mass Effect 2. They can choose to import their character from a finished and saved Mass Effect game. They can also start fresh with a new character. Whichever they decide to go with will impact the game. Importing a character from the previous installment will also allow a player to start Mass Effect 2 with several bonuses. One of the best single player PC games, Valkyria Chronicles has a Japanese military theme. You control your own military force and use your own tactics to defend your country from invasion. Its fourth installment arrived on March 2018. It is a great game for anyone who enjoys strategy war games. Bethesda’s action role-playing video game released its fifth installment after working on it for more than five years. The setting of this game takes place 200 years after its predecessor, The Elder Scrolls: Oblivion. The primary goal is to defeat the dragon Alduin the World-Eater and stop it from destroying the world. Bethesda also released an updated special edition of the game with improved graphics and performance. It also includes an additional quest. Another installment of the role-playing game from Square Enix makes the list! The game allows the player to interact with objects, people, and enemies from a third-person perspective. Creating simple if-then statements can allow your characters to fight without needing too much attention from you. Final Fantasy XII received numerous Game of the Year awards. It also sold over 6 million copies within three years after it came out. From The Witcher series, a collection of novels from Andrzej, comes CD Projekt Red’s The Witcher: Wild Hunt. The player gets to take on the role of Geralt of Rivia. He looks for his adopted daughter who is trying to run from the Wild Hunt. Critics laud the game’s excellent narrative, design, and gameplay. It’s time to take a rest from the battles. Put down your weapons and test your wits with some of the best single player PC games of all time! Now, here’s a video game that’s going to blow your mind! Portal isn’t the usual adventure or action role-playing game. It’s a puzzle game that requires you to use your wit and cleverness to escape a secluded facility. It may have received some criticism for its short duration and story, but it definitely won praise for its uniqueness and originality. Day of the Tentacle is one of the best PC games of all time since the early nineties. It may not have the sophisticated graphics and storytelling of today’s video games. The timeless adventure play will still entertain you, though. The story follows Bernard Bernoulli and his friends as they travel through time and solve puzzles to stop the Purple Tentacle from taking over the world. Long before 3D graphics, complicated controllers, and virtual reality, which are now some of the trademarks of modern gaming, there was Rainbow Islands. Who says a cool video game can’t be colorful and cute? This eighties arcade game is! The story follows Bobby and Bubby as they journey to fight the Dark Shadow and save the Rainbow Islands. It may have simple objectives and controls, but this game is addictive! Create your world and imitate life! Here are two of the best world-building and simulation games. If you enjoy tending to a home in Sims, you’re also probably going to love taking care of an entire civilization! The goal of the game is to lead your civilization to world power throughout different millennia. You can achieve this by discovering new cities and traveling the world. You also need to build and deploy military troops. It’s like being the president of your own country! Released in the nineties, Red Baron allows you to play as a pilot during World War I. You may fly for either the Royal Flying Corps or the German Air Service. You also have the option of choosing from several single-mission options or a career mode. You’ll find a lot of good farming simulation games online and on app stores, but Stardew Valley is one of a kind. Its loyal fans value it for its excellent content, aesthetics, and heart. Grow some crops, manage a farm, and earn some cash. There’s more to do beyond that — fancy foraging, fishing, or mining? Need help? Simply turn on its multiplayer mode. It’s no longer surprising it’s one of my best single player PC games (and one of the best indie games too!). Most of the best single player PC games need more than character muscle flex. They also demand stealth and strategy, which are higlighted in the following games. The Japanese adventure stealth video game is set before the events of the first Metal Gear and after Ground Zeroes. Players take on the role of Venom Snake as he leads his soldiers on a revenge mission. The game received praise from critics for allowing players a high degree of freedom to accomplish the objectives. Ubisoft’s stealth game came out on March 2005. It then became available to all sixth-generation video-gaming platforms. It was such a hit it sold over 2.5 million copies within a month of release. The story follows agent Sam Fisher trying to locate computer programmer Bruce Morgenholt. The game has a darker tone than its predecessors. It features more combat moves for the main character. If you would rather be the villain, then maybe this strategy game from the late nineties is for you. As a Dungeon Keeper, the player builds and manages a dungeon. You keep it “safe” from the heroes of the game. The primary goal is to take over the world by defeating the heroes and other dungeon keepers across the realms. Are you for House Atreides, Harkonnen, or Ordos? You decide! Dune II follows the story of an emperor desperate to harvest a drug from Arrakis that he is willing to offer sole governorship of the planet to the house that delivers the most drugs to him. Players can choose which house they want to command. To win, they must finish several missions. 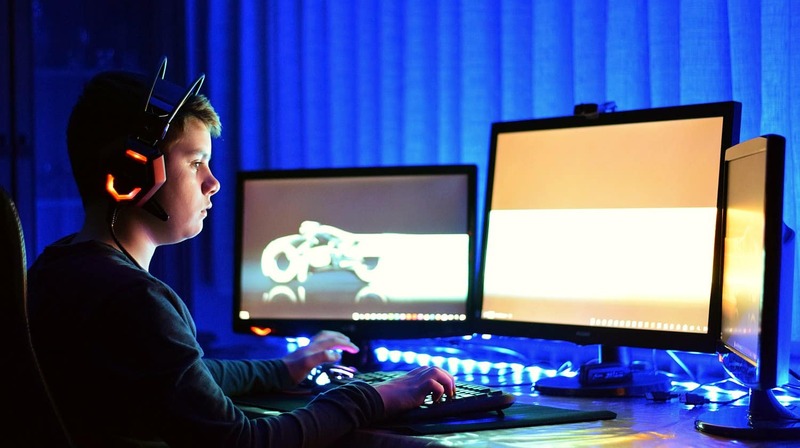 If you were one of those kids who stayed inside the whole time playing video games, your parents must not have liked it and might have even forced you to stop. They may not know there are certain benefits to playing video games, though. 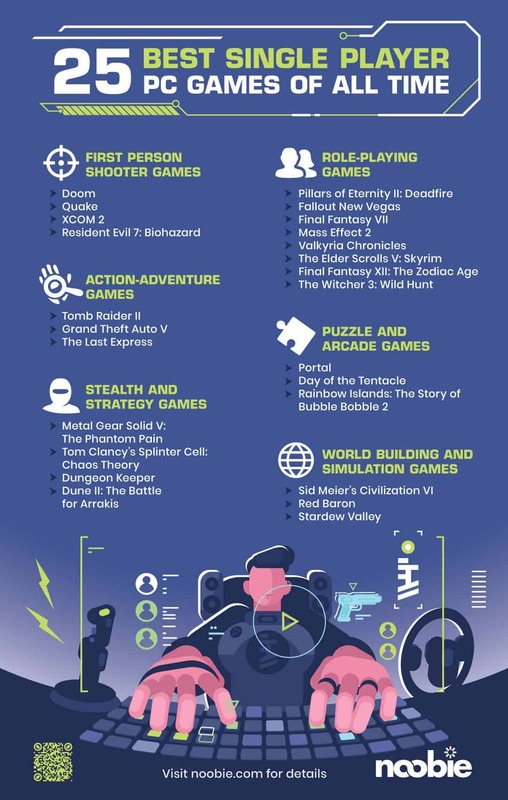 Some of these, including those on our list of the best single player PC games, are tactical or strategic so they can definitely exercise the brain. They let players practice or enhance their critical thinking skills. They can also teach about time management and boost creativity. Still, too much playing can be bad. Did I miss other best single player PC games? Let me know in the comments section! Editor’s Note: This article was originally published on August 2, 2018, and has been updated for quality and relevancy.